The 83rd sneaker mask created by Freehand Profit. Made from 1 pair of Nike SB Dunk Highs. Find out more about the work on FREEHANDPROFIT.com. In a little over two weeks I’ll be releasing my 100th sneaker mask and over the course of the past few months I’ve been remastering published work as well as releasing unpublished masks. I released my very first on November 12, 2010 during MASK365 (Click here to read more about my year long, daily creative project inspired by Skull A Day). Today I’m proud to present my 83rd sneaker mask made from the iconic Tiffany Dunks. My masks explore a number of issues, you can get a start on deciphering it by reading my artist statement but much of what the work means is left as a trail of bread crumbs through this blog. Each mask can carry an entirely different intent, not just a different character. 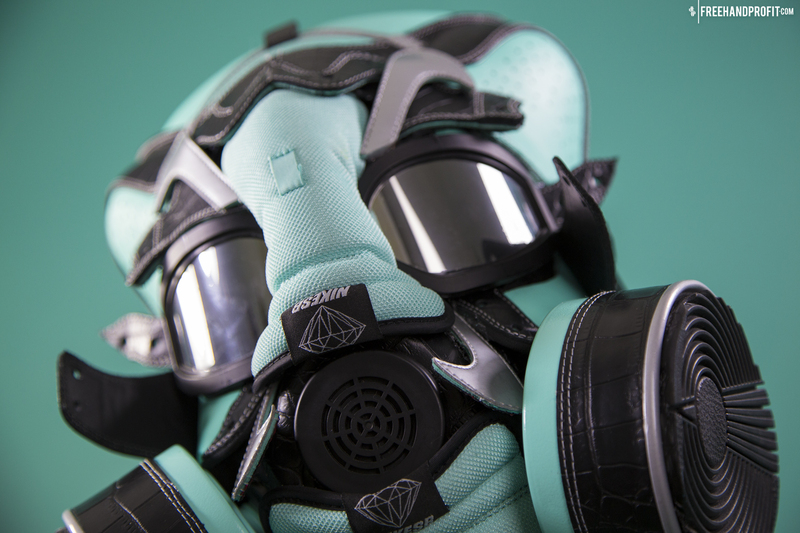 For example the Tiffany SB Gas Mask lends itself to a discussion of materialism on multiple levels. It becomes a symbol of the hype, of a society that breeds a youth and street culture that will spend and make fortunes – not through their own innovation or ingenuity, but by reselling sneakers. Micro-economies pop up and dry up faster than we can keep track of, like we’re all in a financial drought, frantically digging wells that lead nowhere. Then there’s the nickname, referring to the illustrious Tiffany & Co jeweler’s signature mint. A perfect comparison when you consider how deeply we covet, not just precious metals and gems but sneakers crafted from leather and rubber. The black leather, embossed with a crocodile skin texture, continues to speak to our desire for luxury and high fashion. These colors and materials we drape ourselves in carry connotations that we perpetuate. As an artist who decided to turn his materilistic desires into the materials that I make my art with, I use the parts of these sneakers as elements and symbols to unravel and reveal the things that define our identity and reshape our future. Few SBs can step out of the shadow of Tiffany Dunks. When the Lows dropped in 2005 they’d make a ripple that would help solidify SBs in the realm of sneaker culture for the next decade. The colorway has since been reimagined by countless customizers, sneakerheads and streetwear brands – from kicks and tees to cars. 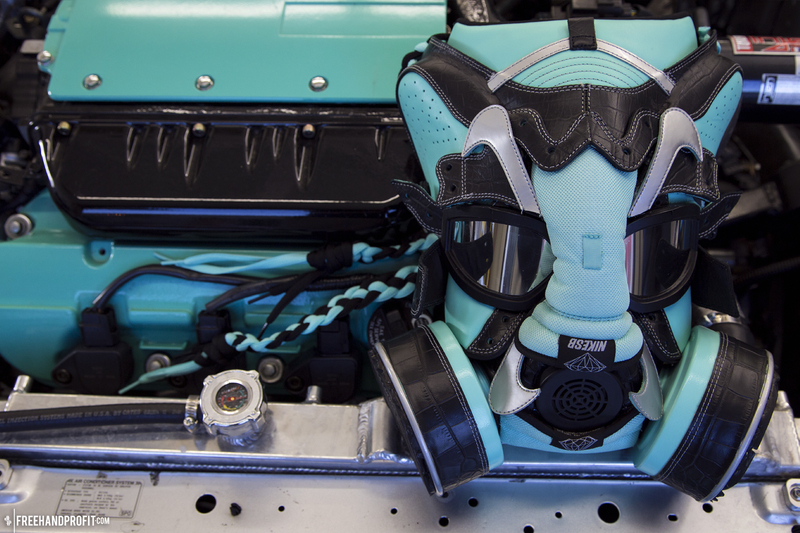 The Tiffany Dunk SB Gas Mask was commissioned by @DubStepSlap415 who also brought out his minty Honda Prelude for our shoot. It’s aqua accents match the Tiffany Dunks perfectly and they don’t stop under the hood. The entire JL32 V6 swapped ‘Lude was wrapped by @speed_fiendz_garage in the iconic blue green hue, you can catch it in person at SFAutoSalon on November 18th at the Mascone Center. We also have plans for a mask shoot with the car at a track so this won’t be the last you see of the Tiffany SB Gas Mask. “The release of the Tiffany Dunk was a still point in the turning world of street culture. Easily transcending the ceremonious hysteria generated by a large majority of sneaker releases, this Holy Grail of footwear arrived as a collaborative effort from Nike SB and Diamond Supply Co. that initially dropped in 2005 with around 4,000 pairs hitting shelves. Representative of a past era of sneaker culture, the Tiffany Dunks evoke desire in some, amazement in others, and admiration in all.” – Read more in depth history of the Tiffany Dunks on GreenLabel.com. 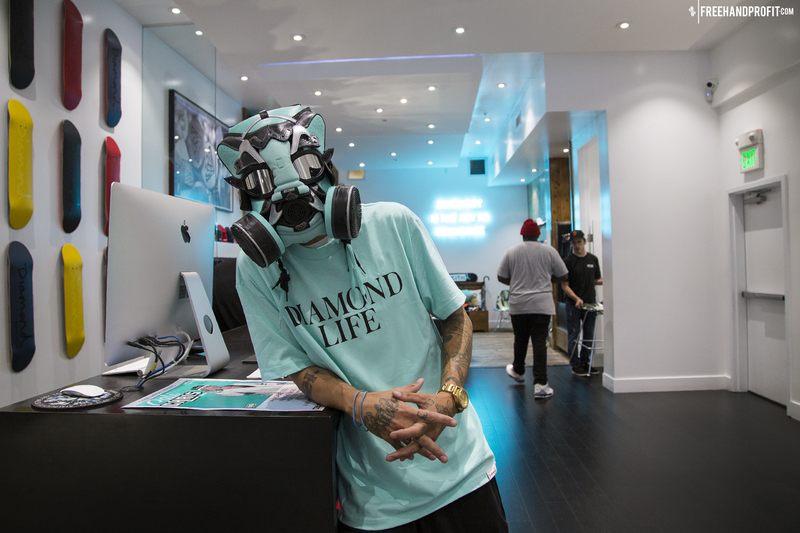 Being that I moved my studio in LA to Northern Cali earlier this year it was obvious the mask should be shot in San Francisco, birthplace of Diamond Supply Co. So I headed out to SF to shoot the Tiffany SB Gas Mask with the help of good friend Jason Seals, interesting fact – he was the first person to ever put a pair of Jordans on my Chopping Block. We hadn’t planned shots or even scouted locations – some of my best city shoots happen because I have my eyes open and am looking for the ignored and subtle beauty within city living. There was one spot we had in mind, the flagship store for Diamond Supply Co. Photographers know, shop owners are hit and miss about allowing impromptu photo shoots. Luckily when I pulled the Tiffany SB Gas Mask out of my duffel the good folks working that night were familiar with the work. They agreed to let me shoot in a few spots around the shop. I snapped away, trying to capture all the awesome possibilities without wearing out my welcome. We had arrived shortly before closing which also meant we were chasing the sunset, luckily we were already on the infamous Haight street.